How about Therapy Beads? Beads of Courage http://www.beadsofcourage.org/pages/glassbeads.htm is a program whereby people who make beads (lampworkers) donate beads to this program and they are given to Children who are going through medical treatments at hospitals and you only have to look at their faces to see how much they love and benefit from the beads. I find the beads to also be more of a therapy benefit and from a lot of the feedback I receive from different people it seems that they are collected for their beauty like little gazing balls worn on your necklace or bracelet. Scientists have actually studied and documented the brain waves of people while they are viewing art and have found beneficial brain activity while they do so. 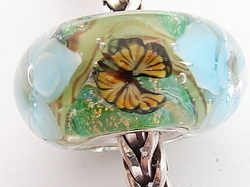 So the next time someone you know is recuperating why not give them a floral therapy bead. Such a unique get well gift will certainly bring someone lots of joy even long after they are well!